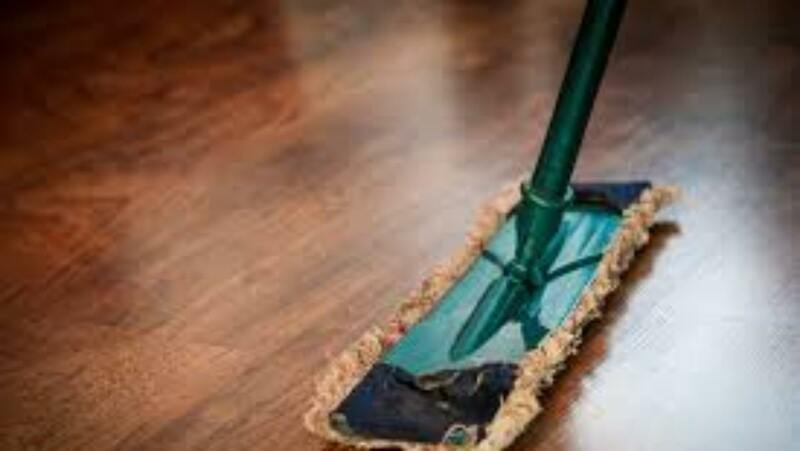 Finding your vacuum cleaner's make and model can be challenging. Car companies like GM, Ford and Mercedes all produce product lines that differ from one another. GM makes Chevrolet and Buick. That's why we say Chevrolet and Buick are 'Makes' of GM... because GM makes them. Duh! But Chevrolet itself also produces a bunch of different types of things... cars (Corvette, Camaro, Impala) and trucks (Silverado, Colorado, S10), SUVs, minivans, commercial vehicles, etc. You can buy a Corvette Z06 or Stingray, or you can buy an Impala 2-door or 4-door. All of these differences constitute different 'Models' of that car. Virtually everything manufactured has a Make and Model. Just taking a walk around the store here, I snapped a photo of the back of our microwave in the kitchen. It's been sitting here for over 13 years dutifully warming our coffee and lunches. You can see it has a model number stamped on a plate, and that plate is in an obscure location... the back. 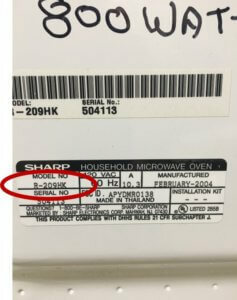 These plates on manufactured products look pretty much the same and they offer a lot of other information about the microwave in addition to the model number. Despite its obscure location, I studied the plate, even googled parts of it. Boy was I amazed at the things I learned from the information on this plate... when and where it was manufactured and who approved it for sale, to name a few. Here's another photo. It's a depiction of the underside of our George Forman Grill. We have it because Mark likes the pinini grill marks it leaves on his sandwiches. 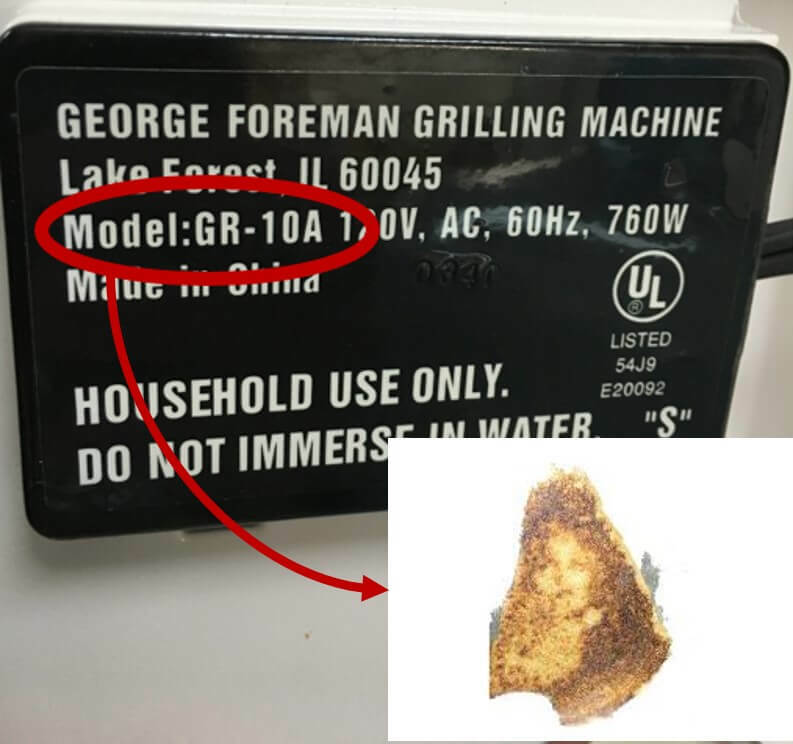 Did you know that George also makes grilling machines that leave different kinds of grill marks? 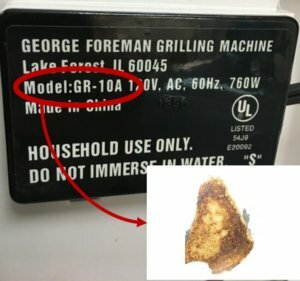 You can see in the photo that they even make an adapter that leaves grill marks in the shape of Mother Teresa. That's a grilled-cheese sandwich. Sadly, that adapter doesn't fit our grill. How do I know this? I know this because I told the George Forman Grill call-center person in India our George Forman Grill Model Number. I digress. The point is... knowing your device's Make and Model is crucial regardless of what device we're talking about, be it a George Forman Grill or a Hoover Vacuum Cleaner. Speaking of Hoover... did you know that still today, in 2017, we're still maintaining parts and supplies for over 1,400 models of Hoover devices (vacuums, shampooers, combo-cleaners, etc.). 1,414 to be exact (we counted). That's a ton of models requiring a complex matrix of parts and supplies. Some are OEM while others are after-market. Some are private-labeled to other manufacturer's products and still others are bought from those very manufacturers. James Spangler is rolling over in his grave at the unnecessary complexity built into the vacuum cleaner industry. There's only one clean way to navigate the complexity... KNOW YOU MAKE AND MODEL! With it, you can find anything. Guy (walking into the store): "Hi, My mother-in-law is coming into town tomorrow and my wife sent me to get some vacuum cleaner bags"
Store Clerk: "Ok. What kind of vacuum do you have?" Guy (stares blankly): "They all look the same. Ours looks sorta like that one. Um, yeah that's it. It's a blue Hoover." Clerk (rolls his eyes): "Do you know your machine's model number? We can guess but we'll be running a 1 in 1,414 chance of getting it right." Guy (sighs): "I'm in trouble." Knowing your make and model is the only sure way of knowing you'll get the right parts and supplies. Any other way is a crap shoot. And it only takes a few minutes to look for that obscure plate and write down some information from it. Last example that plays out in vac shops across the country everyday. Here's another photo of an adorable elderly couple's vacuum cleaner. They'd had this Lux 1205 most of their married life, loved it and saw no reason to buy a new one. This thing dated back to the Nixon era. Gas was 54 cents and "The Streak" was popular when this machine rolled off the production line (remember 'The Streak' here, but do so at your own risk). Understandably, we don't stock replacement parts for too many... um... museum quality machines. But we do know, from experience, that the model number is located inside the hatch where the bag goes. It's actually stamped into the machine's body, into the metal. We found it and I'll tell you... it was infinitely easier and quicker to find what was needed and fix what was broken knowing the make and model. 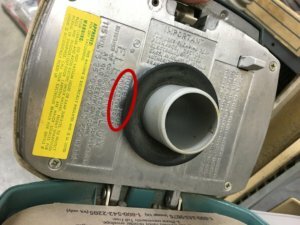 Need help finding the make and model on your machine? Check out our video here. It gives several examples from different manufacturer's machines. Love the next vac you buy!